Here’s my take on food waste. 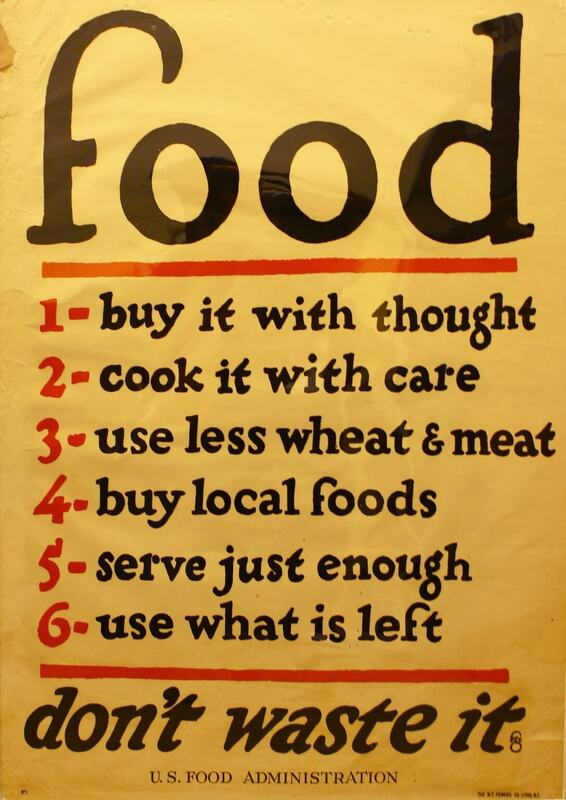 It goes back in part to lessons I’ve learned from studying World War I (WWI), when the American government set food conservation goals, along with goals for local and home front food production via Liberty – later Victory – Gardens. I’m a big proponent of both reducing food waste and producing more food in communities (via school, home and community gardens.) On both fronts, the WWI poster included in this post holds advice we’d be well served to heed today. Period piece or photoshopped image? It’s an iconic poster from WWI and one of my favorites. Food…don’t waste it. The image is regularly shared on Twitter and Facebook. The original was produced in 1919 by the United States Food Administration, under the direction of the newly appointed food “czar” – Herbert Hoover. The poster was reissued during World War II. It’s been revised in recent years, by individuals and organizations interested in encouraging an ethos incorporating local foods and sustainability. While I’m the UC Food Observer, I also dabble in the history of wartime poster art. I’m often asked if this is a contemporary mock-up made to look and feel vintage. It’s not a mock-up. It’s the real deal, produced nearly 100 years ago, with messages we should embrace today. WWI marked the first large-scale use of propaganda posters by governments. Posters, with easy-to-understand slogans and compelling images, made powerful propaganda tools. The government needed to shape public opinion, recruit soldiers, raise funds and conserve resources. There was also a need to quickly mobilize citizens to important home front activities…including gardening, food conservation and food preservation. In an era before television and widespread radio and movies, posters were a form of mass media. They appeared in windows and were posted on walls everywhere, in as many languages as were spoken in this nation of immigrants. Professionals accustomed to selling things to the American public produced these media products, including posters. The “mad men” of advertising (a later generation is featured in a contemporary, award-winning television show) held strategy meetings every Friday night at an office on Fifth Avenue in New York, their “clients” bureaucrats from Washington, D.C. The government engaged the services of hundreds of writers, artists, speakers, and scholars to promote (and curtail) messaging around the war effort. This work aspired to help mobilize a nation, to link the military effort with the home front, to boost food production (and conservation) at home and at work, and to unite the power of art with the modern science of advertising. 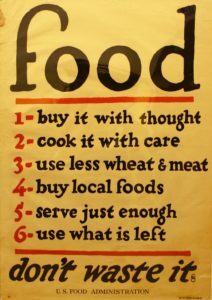 The original poster promoted six food “rules” that we’d be well served to adopt today, including observing (at least) occasional wheatless and meatless days. The fourth suggestion – buy local foods – is somewhat of a surprise to people today, because the notion of buying local seems somewhat modern. But in WWI, the U.S. government encouraged the local production and consumption of food, in part, to free trains to more effectively ship troops and war materiel. Following these suggestions worked. The U.S. was able to greatly increase exports to its allies and the public engaged in important ways around home front food conservation and production efforts. Note: If you want to dig a little deeper into the art form, the posters of WWI were influenced by the La Belle Époque – the beautiful era – named in retrospect, after the full horror of WWI had been revealed. The Art Nouveau movement in France and the rise of modern advertising were also important in shaping how posters were used during wartime. Technical improvements in printing, including a process called chromolithography, facilitated mass production of the vibrantly-colored posters. Learn more in Chapter Four of this book. Rose Hayden-Smith currently serves as editor of the UC Food Observer, a communications platform in support of UC's Global Food Initiative. She writes a daily blog about food and agriculture. In the past, she has developed programs for youth and adult extenders in food systems/agricultural literacy, garden-based learning and youth and community gardening. Hayden-Smith is also a practicing U.S. historian and a nationally-recognized expert in the history of youth/school gardening; Victory Gardens; extension education; federal policy relating to agriculture/education; and the American homefront in wartime. A Kellogg Food and Society Policy Fellow, her national advocacy work focuses on encouraging a national effort to promote school, home, and community garden and urban agriculture efforts; public policy relating to food systems, gardening, education and urban agriculture.